Armchair Fiction presents extra large editions of classic science fiction double novels. The first novel is “The Corianis Disaster” by one of science fictiondom’s all-time best authors, Murray Leinster. The Corianis was traveling between the planets Kholar and Maninea, and she was carrying the Planetary President of Maninea and important political figures from Kholar. Physicist Jack Bedell knew at once that something was wrong when he found he could see the stars at a time when they were supposed to be in overdrive. But the disaster really shaped up when they apparently reached their destination! What they found upon landing was that there were two Corianis’, each with its own set of duplicate people. And these people weren’t copies or imitations—they were exactly the same. Queerly, there were two exceptions, Bedell and a lovely young woman, Kathy Sanders. But why had they been excluded from this fantastic scientific anomaly? And what was the planetary government to do with two identical leaders—each with his own mind and his own voice? Join science fiction maestro Murray Leinster as he spins a taut tale of science and physics gone mad. 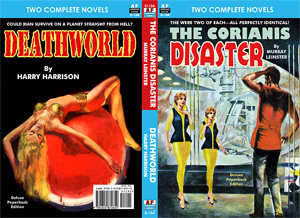 The second novel is “Deathworld” by Harry Harrison. The planet Pyrrus had a gravity nearly twice of Earth; its severe axial tilt created extreme weather patterns, and it was constantly besieged by earthquakes and volcanic eruptions. Having two moons, Pyrrus’ tides caused constant flooding, sometimes emersing live volcanoes with disastrous results. Even worse, virtually all living things on the planet were predatory. A human being didn’t have a chance. The larger animals were quite capable of killing a man instantly and the smaller creatures were filled with deadly poison. Even the plant life was carnivorous. However, men had discovered that Pyrrus contained many valuable ores, so settlements had been established. But because of the planet’s mercilous environment, its few settlers were engaged in an endless struggle against the teaming forces of a planet gone mad. So, naturally, all of this begged the question: was it worth it?